Wanted dead or alive? Just dead, thank you. These pests can catch you by surprise; one day your cucumber vines are beautiful, the next day you find them wilted and lying on the ground. Your pole beans that were almost ready to harvest are suddenly wilted and dying. You've been visited by one of the most common insects to attack your veggie garden. I'll explain what they are and the best ways to control them. It's that time of year again as we begin to see damage appear on our warm season crops. Unlike many other "bugs" the damage caused by these warm season pests is easy to detect. It would be impossible to describe all of the pests that you might come across but the five I will describe are the most common that you will find across North America. Favorite Plants: Cucumber, cantaloupe, winter squash, pumpkin, gourd, summer squash, and watermelon. 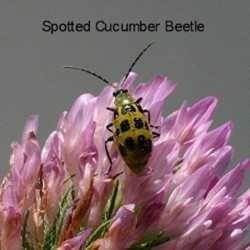 Distribution: Cucumber beetles are native insects and occur throughout the United States from Canada to Mexico. They are most abundant and destructive in the southern range and are usually not a problem in sandy soil. What They Do: They cause four types of damage: seedling destruction, flower and foliage damage, root feeding, and transmission of bacterial wilt. How To Control Them: The first method and the easiest is to cover the plants with a row cover made from a fabric such as Remay. The second method is to plant a "trap" or "decoy" crop of cucurbits early in the spring. When the beetles appear on the "decoy" crop insecticide is used to kill the emerging pests. You need to be sure and dispose of any of the plant debris form the "trap" crop to ensure no eggs could remain and hatch out later. The third method is chemical control. Recommended chemicals include rotenone, methoxychlor, malathion and carbaryl (Sevin) applied according to label directions and safety precautions. Favorite Plants: The corn earworm infests over 100 plants, but corn is the preferred host. It feeds on at least 17 cultivated plants: alfalfa, bean, chrysanthemum, corn, cotton, geranium, gladiolus, okra, peanut, pea, sorghum, soybean, strawberry, sweet pepper, sweet potato, tobacco, and tomato. The earworm is also found occasionally on wild hosts such as toadflax. Distribution: This insect is found throughout most of the western hemisphere. Annually it is among the most destructive insect pests in the United States and has been found as far north as Saskatchewan. It has recently been introduced into the Hawaiian Islands. 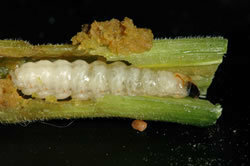 What They Do: The corn earworm prefers the fruiting stage of the host; it will also attack the foliage. During May and June, the larvae feed in the tightly coiled blades of corn. As a result, numerous ragged holes appear when the blades unfurl. Wet, tan to brown excrement lodges in the whorl and blades. Since the eggs are laid on corn silks, larval damage is confined largely to the developing kernels in the ear tip area. Round holes through the shuck are usually emergence holes. Third-generation damage may occur on very late corn, but larvae of this generation develop primarily on sorghum, soybeans, peanuts, and cotton, depending upon location. How To Control Them: In sweet corn, very early plantings require fewer treatments than late-season corn because earworm population densities increase as the season progresses. Organically acceptable methods: Biological and cultural controls and sprays of Bacillus thuringiensis is acceptable for use on an organically grown crop. Insecticides recommended for earworm control are Ambush, Pounce, Asana, Baythroid, Capture/Brigade, Larvin, Mustang Max, SpinTor, and Warrior. As always follow label instructions. Favorite Plants: All types of squash, gourds and pumpkins, cucumbers and melons. 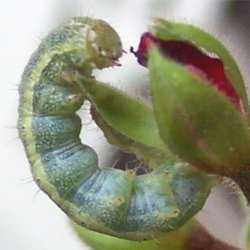 What They Do: The larvae bore into the stem and feed on tissue, hollowing out the vines. The majority of larval activity will occur at the lower four feet of vine. Plants wilt and usually rot and die beyond the point of attack. The first indication of an attack will be the sudden wilting of a long runner or of the entire plant. Upon close inspection, frass may be found emerging from the infested stem. Partial or complete crop loss may occur. How To Control Them: You can physically block adult borers by placing floating row covers over your vine crops when they start to vine (or for non-vining varieties, starting late June or early July) or when you first detect squash vine borer adults. Keep the barriers in place for about two weeks after the first adult borer has been seen. Be sure the row covers are securely anchored to prevent adults from moving underneath it. Note: Generally do not use floating row covers anytime crops are flowering. This prevents bees from pollinating your vegetables which will have a negative impact on plants. An exception to this would be if you pollinate your crops by hand while the floating row cover is erected. Chemical Controls: If insecticides are needed, spray or dust the stems at their base. Start treatments when vines begin to run (or the last week of June or early July for non-vining varieties) or when the first adult borers are detected. Repeat in 7 to 10 days. Two applications help manage most squash vine borer adults. For more thorough coverage, continue treatments at 7 to 10 day intervals until the end of July. Recommended insecticides should contain carbaryl, permethrin, or bifenthrin as the active ingredients. Follow label instructions for application rates. 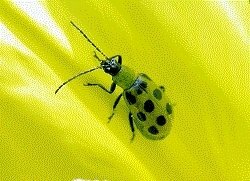 The Mexican bean beetle is one of the few harmful members of the lady beetle family. 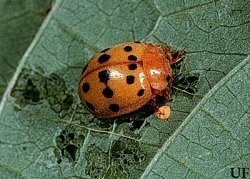 The copper-colored adults resemble large lady beetles. Favorite Plants: Garden beans, cowpeas and soybeans. What They Do: This pest feeds on the undersides of leaves leaving the leaves skeletonized with a lace-like appearance. Severely affected leaves often dry up and drop off the plant, reducing photosynthesis. How To Control Them: Biological control. There are at least 17 species of predators. They feed on bean beetle eggs, larvae and pupae. The beetles are protected by hard wing covers and by an offensive, yellow liquid which is secreted in small drops from the leg joints when the insects are disturbed. Contact your local extension office for a list of predators suitable for your particular area. Neem oil will deter feeding adults; horticultural oil and insecticidal soap are useful against the larvae. This is the first garden pest I can remember seeing as a child; I can remember my dad picking them off of his tomato plants. Favorite Plants: Tomato, eggplant, pepper, and potatoes. Distribution: The tomato hornworm is native to the United States, and is commonly found throughout the northern states. What They Do: This pest feeds on the upper portions of leaves, leaving behind dark green or black droppings. 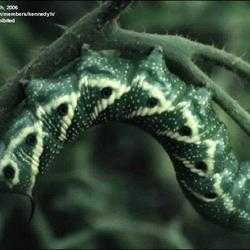 The larvae blend in with the plant canopy, and therefore go unnoticed until most of the damage is done. Late larvae are capable of destroying several leaves as well as the fruit. 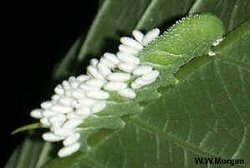 As the larvae mature in size the amount of defoliation increases. How To Control Them: Handpicking the hornworms from infested plants is a safe and effective option in smaller plantings. Roto-tilling the soil after harvest will destroy many of the burrowing larvae which are attempting to pupate. 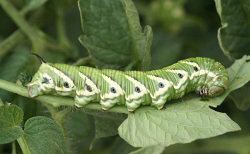 Tomato hornworm larvae are also parasitized by a number of insects. One of the most common is a small wasp; Larvae that hatch from wasp eggs laid on the hornworm feed on the inside of the hornworm until the wasp is ready to pupate. The cocoons appear as white projections protruding from the hornworms body if such projections are observed, the hornworms should be left in the garden to conserve the beneficial parasitoids. The wasps will kill the hornworms when they emerge from the cocoons and will seek out other hornworms to parasitize. Chemical controls are not usually necessary. As I mentioned earlier it is impossible to describe all of the insects that you might come across in your gardens. The key to controlling pests as well as disease is early detection. Observe by walking around, on regular basis; inspect your plants for early signs of damage whether it is from insects or disease. This will make it much easier to get the problem--whatever it might be--under control.